A recent dev diary for Hunted: the Demon's Forge detailed some in-depth specifics of the Wargar enemy type for the upcoming two player co-op action game. 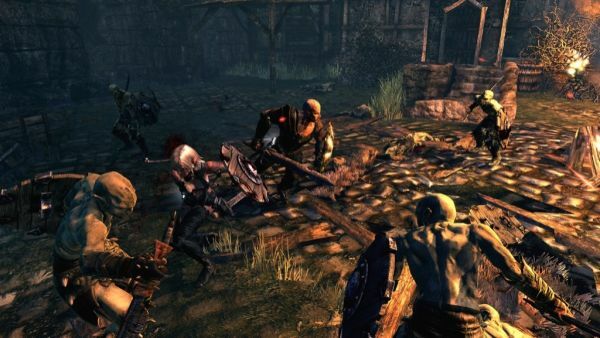 Most actions games have a type of enemy that is common and pervasive throughout most of the game. The Wargar take that role in Hunted. Far from being uniform, however, the Wargar come in three flavors: melee, ranged, and caster; furthermore, there are different classes within these standard roles. Melee Wargar are composed of Soldiers, Warriors, Guardians, and Zealots, Ranged Wargar can either be Archers, Scorchers, or Blastcasters, while the Infected are the only Caster Wargar. Each of these classes have different behavior types, different strengths and weaknesses, and different dangers associated with them. The dev diary post shared a lot of this information as well as some potential counters. I've broken them down into a nice list, as follows. Soldiers: Pack fighters (weak alone). Often appear in groups of three or more. Susceptible to well-timed attacks. Warriors: Utilize small shields. Their shields are susceptible to E'lara's Arcane Arrow, or she can shoot around their shields to deal a killing blow. Guardians: Heavily armored with large shields, making E'lara weak against them. Caddoc can take them down with melee attacks while making sure to protect his ranged companion from them. Zealots: Dual wield axes while relentlessly pursuing a single target. Extremely powerful and dangerous. Archers: Utilize cover and attempt to flush out their enemies. Do more damage the closer they are to their targets. Scorchers: Shoot fire arrows at their enemies, which deal large amounts of damage. Taking cover as soon as you see the telltale sign of smoke and picking them off as soon as possible is advised. Blastcasters: Shoot explosive arrows that explode after a few seconds, dealing catastrophic damage. Infected: Commanders of the battlefield. The longer the duration of their presence, the stronger all other enemies will become. Can buff other Wargar with Battle Charge (enchants their weapons with a damage boost), resurrect fallen Wargar, and teleport around. I don't know about you guys, but I definitely like having diverse enemies and enemy behavior types in my action games and RPGs, and Hunted looks to have just that. Hunted: the Demon's Forge releases June 1st, 2011 in North America and June 3rd in Europe.